Wine should be just the right temperature – too hot the wine will be flat and too cold you will not taste the flavor. 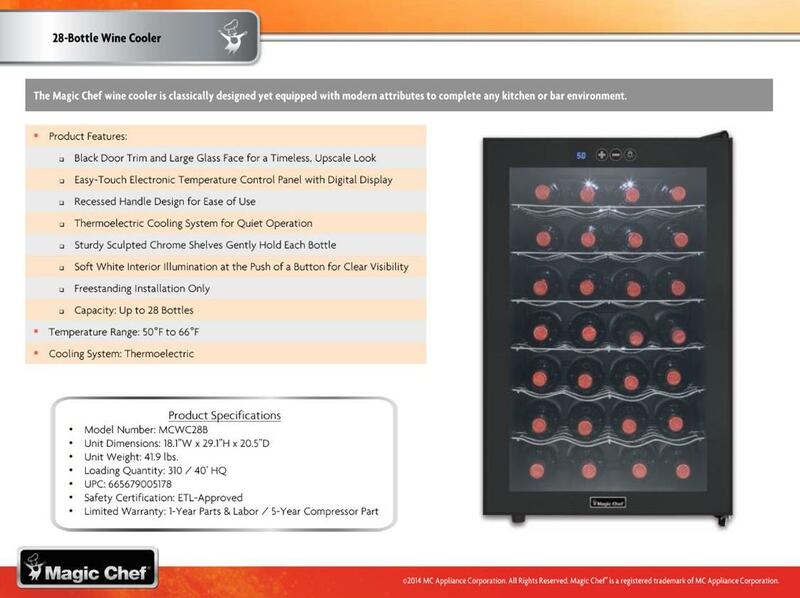 With the LED temperature display on this 28 bottle Magic Chef MCWC28B Wine Cooler you will be able to maintain the correct temperature for your perfect glass of red or white wine. Plus, free up space in your refrigerator. This wine cooler has adjustable temp control, quiet cooling, soft white LED lights, six removable racks, leveling feet and glass door. Quiet Thermoelectric Cooling Technology; Exterior Digital Thermostat with Blue LED Display; Soft White LED Stage Lighting with On/Off Switch; 6 Removable Sculpted Chrome Wine Bottle Racks; Adjustable Leveling Legs for Uneven Surfaces. Freestanding, the unit can fit anywhere you have space.